Technical Expert Assistance – MRV Specialist. USFS is seeking the services of an MRV specialist to work with B+WISER and other local partners to design an MRV system for the Philippines. Download the terms of reference to know more about the scope of work. 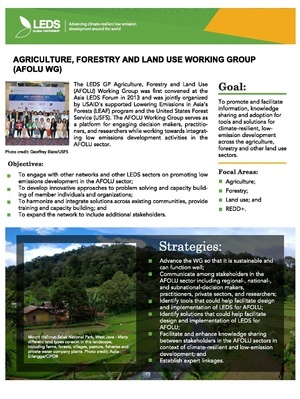 The LEDS GP Agriculture, Forestry and Land Use (AFOLU) Working Group was first convened at the Asia LEDS Forum in 2013 and was jointly organized by USAID's supported Lowering Emissions in Asia's Forests (LEAF) program and the United States Forest Service (USFS).The AFOLU Working Group serves as a platform for engaging decision makers, practitioners, and researchers while working towards integrating low emissions development activities in the AFOLU sector. The Working Group promotes and facilitates information, knowledge sharing and adoption for tools and solutions for climate-resilient, low-emission development across the agriculture, forestry and other land use sectors. The ASEAN "Fire Alert" Tool? Each day, satellite imagery provides us information on hotspots in the ASEAN region. Using such data collated by the ASEAN Specialised Meteorological Centre (ASMC), together with online databases and mapping technologies, we are able to alert you, via your Android Phone App, if an area of interest to you has a hotspot registered on or adjacent to your land. 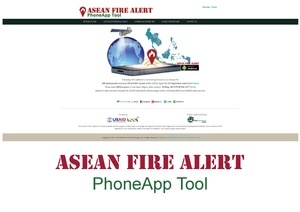 The ASEAN Fire Alert Tool is able to provide every land manager and owner with the ability to be alerted as soon as a hotspot is present on or adjacent to your land. You don’t have to go to a website every day and look for hot spots, these will automatically be notified to you on your android smartphone and only then do you need to confirm where it is and begin to validate the hotspot as a fire and suppress it. 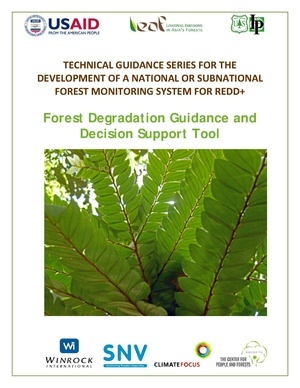 The Decision Support Tool provides guidance on how and when to monitor and measure forest degradation, and how to incorporate forest degradation into the framework of a broader REDD+ measurement and monitoring plan. This document developed by Winrock International’s Ecosystem Services Unit and the United States Forest Service as part of the technical guidance series that has been developed by Winrock International’s Ecosystem Services Unit for the USAID Lowering Emissions in Asia’s Forests Program. 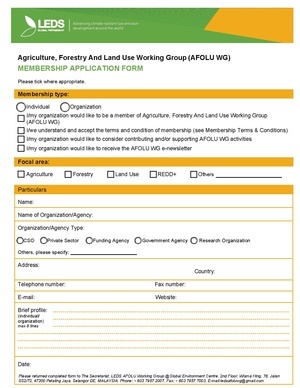 This tool allows users to systematically estimate the CO2 benefits and consequent climate impacts of agriculture, forestry and other land use (AFOLU) programs worldwide. Emission reductions and removals can be quantified at the sub-national and project level for: forest protection, forest management, afforestation/reforestation, agroforestry, crop management and grazing management. (The Carbon Calculator was not developed under LEAF, but is a key reporting tool used by LEAF to estimate emissions avoided or removed). The LEAF Atlas provides a standardized source of information for South and Southeast Asia region by presenting a comprehensive collection of the most relevant and current datasets. The Atlas serves as a resource to a range of stakeholders who are working in, forestry, land use, and climate change in the region. This document presents LEAF's gender integration strategy along with a checklist to implement and monitor gender issues in LEAF programming. It serves as a guide for project managers and project teams to better mainstream gender into REDD+ and climate change mitigation interventions. 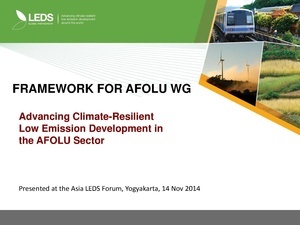 Using the global LEDS framework, these guidelines are produced specifically for the AFOLU sectors and will provide guidance and the integration of a range of tools to develop REDD+ strategy documents or low emissions plans for AFOLU. This decision support tool provides overall guidance on establishing national-level REDD+ accounting frameworks within which project or subnational approaches are integrated. This operational guidance document describes functional roles of stakeholders at different levels: national, subnational, and local; and how these roles can complement each other and combine to contribute to GHG accounting under a national REDD+ programme. 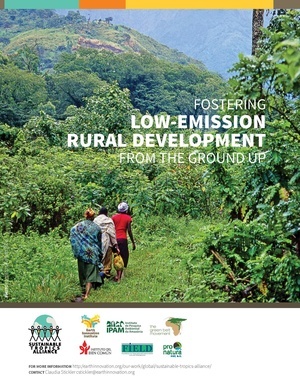 A framework document outlining the overall technical framework for Reference Level (RL) development and Terrestrial Carbon Monitoring System implementation. The following modules focus on deforestation, but further modules will be developed to describe degradation activities. Provides guidance for estimating the Activity Data (AD) for deforestation using previously developed spatially explicit datasets. This module describes the steps necessary to create Emission Factors (EF) for deforestation using existing carbon stock data. Provides guidance for estimating historical emissions (tCO2e.yr-1) from deforestation based on developed EF and AD. This module describes the calculations necessary to estimate carbon stocks and their uncertainty, based on field data collected in a Terrestrial Carbon Monitoring System for REDD+. LEAF has developed three training videos as part of its technical Reference Level training series. The videos demonstrate the use of ArcGIS and IDRISI software to link historical activity data to deforestation drivers (video 1), forest carbon stratification (video 2), and forest carbon sampling design and plot distribution (video 3). http://leafasia.org/tools/terrestrial-carbon-measurement-sop-english Vietnamese Version http://www.leafasia.org/tools/terrestrial-carbon-measurement-sop-vietnamese This manual provides standardized field measurements, based on proven field methods, for quantifying carbon emissions and removals from changes land use and management, to provide confidence in results of climate mitigation activities on the land. This tool calculates carbon stocks based on field measurements taken on the five carbon pools. Outcomes are summed across all plots and all pools to provide an estimate of tons of CO2e per hectare. This tools estimates emissions from selective logging operations. ledsgp.org is built on the same platform as the popular Wikipedia site. Like Wikipedia, it is a "wiki" or website developed collaboratively by a community of users. Thanks to our unique relationship with OpenEI.org, you can add or edit most content on ledsgp.org. For more information about this unique collaboration, contact us. View or edit this page on OpenEI.org. This page was last modified on 17 August 2018, at 15:11.